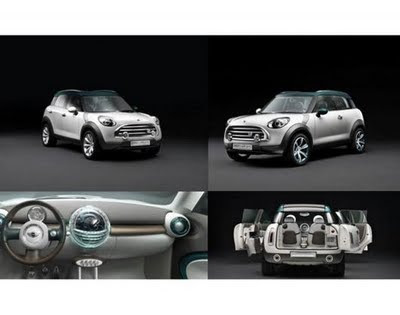 Previews from the upcoming Paris Motor Show keep rolling in, this time from MINI in the form what it calls a 4 x 4 x 4 x 4 Crossover Concept design study - four doors, four drive wheels, four single seats and at four meters in length. With the wheels pushed to the corners and familiar styling it looks like a MINI, but the unique four is the doors - three of the doors are stock standard but the rear drivers' side door slides backwards. The rear door also swivels to one side to ease process of getting your gear into a MINI which boasts more storage space than any other. As well as its swivel feature, the rear door has a frameless, retractable window for skis and the like, and a folding roof cover and a transport case which sits outside of the rear door further bump-up the cars load-carrying credentials. For passengers there are four individual single seats with the rear pair adjustable by up to thirteen centimetres in the rear. The interior drawcard is the new three dimensional display and control console which sorts out all infotainment and navigation functions. This touch sensitive "MINI Centre Globe" is split into two halves so the passenger can surf the web while the driver gets directions. It can also be controlled via buttons on its lower half, by a keyboard tucked under the dashboard on the passenger’s side or by a trackball on the steering wheel which also lets the driver start the car. Not satisfied? There's no steak knives but a teaspoon could be handy for the special collection of dishes and cups from Porzellan Manufaktur, Nymphenburg, which have been created for the Crossover Concept and are designed to sit aboard a new MINI Center Rail – a matt-polished aluminium fastening rail which links the front and rear sections and caters for items like cupholders. The design study is proposed as a fourth variant in the company's current model range and it says the showing is aimed at tempting "new target groups into the world of MINI." If the reaction is positive there's a good chance it will hit the showroom floor in the not too distant future.